BELIZE CITY, Mon. 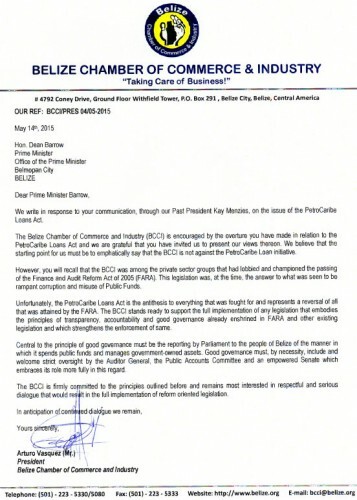 May 18, 2015–Arturo “Tux” Vasquez, president of the Belize Chamber of Commerce and Industry (BCCI), told Amandala today that following an executive meeting held on Friday, the Chamber has sent off a formal letter to Prime Minister and Minister of Finance Dean Barrow, calling on the Government to rethink the manner in which PetroCaribe funds are being spent, and also calling for open dialogue on issues of accountability and spending. Last Thursday, Barrow—who had been adamant that there will be no repeal of, or changes to, the PetroCaribe legislation passed by Parliament in March—announced a set of amendments, which, he said, was merely meant to spell out what is already the legal position. He said that the bill for the amendments has already been drafted for presentation to Parliament. 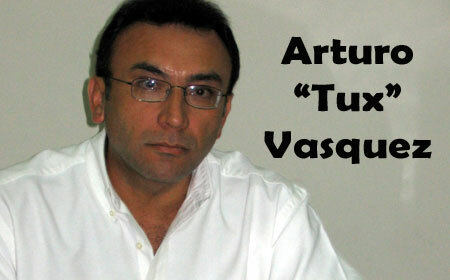 Vasquez said that the funds should form part of the Consolidated Revenue Fund. He furthermore talked about the need for an audit. Barrow claims that the PetroCaribe Fund already forms part of the Consolidated Revenue Fund, so the new clause will just be “spelling out what is already there…” Barrow further said that he wants to assure those who have some misgivings, that there is nothing remotely suspicious about what they are doing. Another amendment to the PetroCaribe law will stipulate that funds may be withdrawn from time to time as the need arises, and the withdrawal and spending shall be subject to the Finance and Audit (Reform) Act and all other applicable laws. “That is how it is at the present time [but] because they are saying it is not so, we are spelling it all out,” Barrow added. He went on to announce the proposal to repeal subsection 3 and replace it with a new clause which will allow the Government to allot a portion of the PetroCaribe funds for compensation to the former shareholders of Belize Telemedia Limited and Belize Electricity limited, the two nationalized utilities, as well as to assist with the buy-back of the Superbond. A new subsection 4, Barrow said, will require quarterly reports on PetroCaribe funds, and will also include a retrospective bill for spending, as well as a prospective allocation proposal for future spending not already approved in the national budget. Barrow said, in reference to the PetroCaribe funds received after this April, “I fully expect to spend…” He said that the end of this fiscal year (April 2016) will be a kind of sunset for the type of spending the Government has been doing with PetroCaribe funds, and thereafter sizeable portions will be earmarked to pay compensation for the utility companies as well as for the Superbond buy-back. While the Chamber does not yet have an official position on the proposed amendments to the PetroCaribe legislation, Vasquez said that they have written the Prime Minister asking for open dialogue. He said that internally, the Chamber also needs to discuss the proposed amendments further. Vasquez made it clear that the Chamber has no objection to the PetroCaribe program, with its low-interest financing over the long term; however, he said, there should be spending controls as well as accountability for the funds, and there should be broader spending on areas such as health and education.